How was the program developed and how does it operate? What are the implementation barriers and facilitators? What do people think of the program? This report is one component of a larger RAND project aimed at addressing income inequalities faced by workers with criminal records. Given the labor market challenges faced by people with criminal convictions, it can be challenging for probation agencies to help their clients find jobs, let alone earn living wages. This report summarizes findings from a descriptive case study of one program focused on the construction industry intended to improve the earning potential of individuals on probation in Sacramento County, California. Using a qualitative approach, the authors provide an understanding of how the program evolved; describe how program activities are delivered; identify implementation barriers and facilitators; and provide an overview of the program's successes and shortcomings as perceived by key stakeholders, including probation agents, construction companies, and probationers. It is crucial to select a "felon-friendly" career field that levels the playing field for probationers. Issues with driver's licenses limit job opportunities for probationers. Identify funding sources and support services to assist probationers with addressing their driver's license issues. 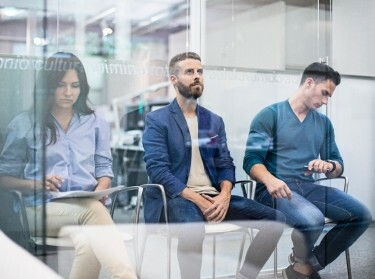 This may include collaborating with the Department of Motor Vehicles to identify a way to address the needs of probationers while still attending to the reason for the suspension or revocation in the first place. Priscillia Hunt @PriscilliaHunt, Rosanna Smart @RosannaSmart, et al. This project is a RAND Venture. Funding was provided by gifts from RAND supporters and income from operations. The research was conducted by RAND Labor and Population. 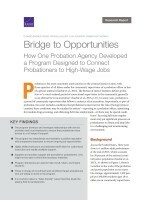 Barnes-Proby, Dionne, Priscillia Hunt, Lisa Jonsson, and Samantha Cherney, Bridge to Opportunities: How One Probation Agency Developed a Program Designed to Connect Probationers to High-Wage Jobs. Santa Monica, CA: RAND Corporation, 2018. https://www.rand.org/pubs/research_reports/RR2179.html.